It is a bit too late to write a proper review of Edward Shanken's authoritative Art and Electronic Media  – the book came out in 2009, and has been already the subject of several thorough and enthusiastic reviews by other hands; but inasmuch as the field of techno-art has continued to explode in accordance with the deliberately headlong tenor of the book, the time is perhaps now ripe to resurrect at least one of its foundational, and heretofore unremarked upon, elements. But first – speaking of "headlong" – James Brown was billed as "the hardest working man in show business," and Edward Shanken must certainly be his equivalent in the field of techno-art: this not only by virtue of his editorship of AEM, but also by virtue of his role as a disciple of Frank Popper, Roy Ascott, and, in particular, Jack Burnham; his seminal essays, including "Historicizing Art and Technology: Forging a Method and Firing a Canon” – said essay, in fact, a prospectus for AEM, and which I will employ as my own launching point; and his being called from one key academic appointment to another, and most recently to a position with the University of Washington's "Center for Digital Arts and Experimental Media" (DXARTS). In "Historicizing Art and Technology" – and citing techno-art's "dynamic growth and extraordinary breadth" – Shanken has had this to say by way of introduction: "What follows constitutes a personal report from the trenches and a call-to-arms." I take this statement not only as a reflection of some uncertainty on his part as to where things may be going, but also as an invitation to each of his readers to provide a personal perspective. This recitation is not intended as a criticism of the University of Washington – there really is some interesting art going on in all of these areas; but we immediately see here a possible cause for Shanken's uncertainty. In its rush to embrace multiple areas of technical progress, techno-art has indeed made the aesthetic realm itself more "pluralistic" – this in keeping with the great arc of human evolution, which demands that, as technology takes ever greater responsibility for our sustenance, we ourselves become increasingly concerned with the "big brained" pursuits of the rational, the aesthetic, and the sublime; but at the same time, this fragmentation of effort carries with it several related dangers: a diminution of the single, clear voice with which art has in the past seemed to speak to humankind; a loss of art's role as the creator of unique and treasured "waypoints" for the human psyche, as represented most dramatically by Michelangelo's David of 1504; and a possible failure, amidst the weltering of technique, to pursue any given style to a fruitful conclusion. To be sure, the dismantling of the monolithic Western art ethos has been for many of us a welcome outcome – one man's "anarchy" is another's "liberation”; but perhaps the pendulum has swung too far; or, in the words of the old adage, "one must be careful what one wishes for." Shanken thus seems to invite other perspectives which might address this fragmentation – i.e., which provide a more coherent view of the battlefield. Joseph Nechvatal, for one, has written at length, and with great personal insight, about this very question. He has been inspired to propose – and to practice – a Dionysian strategy: the creation of "noisy" aesthetic environments in which various practices can merge in fruitful and unexpected ways, and which environments have the additional property of being resistant to a computerized, all-consuming media operating in lock step with the prevailing techno-scientific demiurge. The congenitally Apollonian, however, must entertain other dreams; and given, further, that my own personal perspective draws upon the material of AEM, I dare to offer it now in the context of a commentary on that book. I begin with the fact that I myself am an "old school" kinetic sculptor as opposed to kinetic artist, concerned with electric motors, precision bearings, and definitive visual elements of metal and plexiglas. 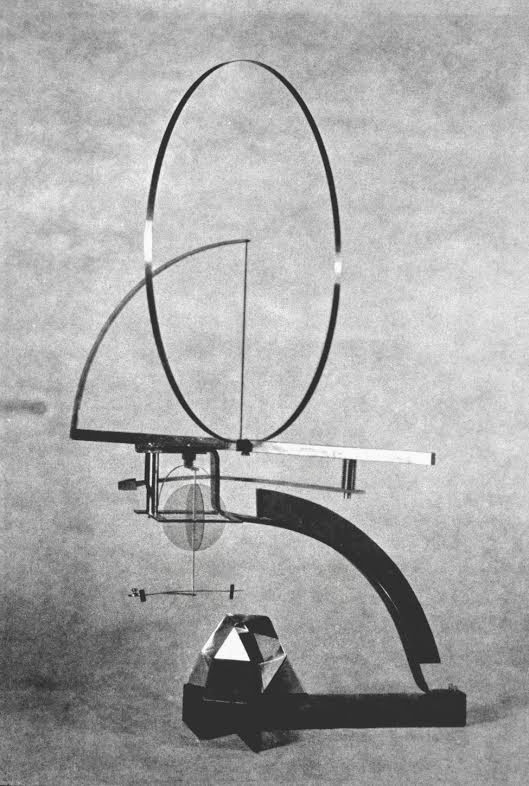 As such, I was delighted to discover that Shanken begins his text "Survey" – although his book's title is Art and Electronic Media – with a brief consideration of the steam engines of the Industrial Revolution, and a not-so-brief consideration of the early twentieth century kinetic experiments by Vladimir Tatlin, Naum Gabo, Marcel Duchamp, and László Moholy-Nagy – pre-electronic experiments focused upon those same electric motors, precision bearings, and definitive elements of metal and plexiglas. We are speaking here, in short, of an art of the machine in its traditional sense – and Shanken thus seems to acknowledge that the fortunes of this art form cannot be divorced from those of an art based upon the computer, which, after all – given the name of its professional society, "The Association of Computing Machinery" – is but itself an ultra-sophisticated machine; not to mention an art based upon even more sophisticated machines, i.e., living organisms. But note carefully, also, my use of the word "fortunes." The adherents of "new techno" may well suppose that the history of "old techno" has been written and laid to rest; and in fact Shanken seems to complete this history by going on, in his Art and Electronic Media survey, to document the career of Jean Tinguely, the most successful practitioner of machine art, and to which artist the Swiss have dedicated an entire museum. If, however, we consider an art of the machine as a microcosm of the challenge faced by all of techno-art, whether "old" or "new" – which challenge might be defined as an engagement with the determinism of the scientific world view – then it must come as a shock to us to realize that Tinguely and his fellows, by introducing random elements, have failed utterly to deal with the machine on its own terms; and so we must also ask to what extent "new techno" has addressed this same challenge, as opposed to a focus on the merely decorative or curious. Objection 1: "Your machine is but a crude instrument, and it is not until art begins to work with more ethereal systems such as the computer – and life itself – that it can begin to show its true colors." What, then, are we to say to those workers of uncomprehending stone, and among whom are Praxiteles, Michelangelo, and Thorvaldsen? Objection 2: "Your machine is an exemplar of the Newtonian clock-work universe, from which we have been freed by quantum physics." To be sure – and we must marvel at the ever-larger systems which have been endowed with quantum properties. At present, however, the largest such system is two three-millimeter square chips of diamond which exhibit, for a mere seven trillionths of a second, the mere property of photonic entanglement, as opposed to the more spectacular ability of electrons to jump through walls; and at present, a child who is allowed to slip past the sill of a twentieth-floor window will still fall to its death. Yes, art must reveal to us a miraculous future; but the best art will also comfort us with an acknowledgement of things as they are. Objection 3: "The machine is passe; the real avant garde is availing itself of the marvels of a computer-enabled and web-connected world." Really? Dismantle your own computer, or any of the servers of Google and Microsoft, and there you will find a machine – the electro-mechanical disc drive – whose basic principle of operation could be appreciated by any of the millions of primitive humans who have held a stick to a clay pot spinning upon a wheel. Not to mention that the electric motor itself is about to enter its golden age, and this by virtue of replacing the internal-combustion engine in hundreds of millions of automobiles. Objection 4: "The machine is utterly devoid of that which is the sine qua non of art, i.e., life and passion." What, then, are we to say to Ettore Buggati, Enzo Ferrari, and Ferdinand Porsche – those creators of heart-stopping machines? And who among us, sitting for the first time behind the wheel of our own automobile, has not held on to it with a death grip, mashed the brake pedal with a comic intensity, and felt sweat breaking out upon our brow as the key is turned in the ignition? Objection 5: "The machine has often been the vehicle of human oppression, and so it is no wonder that Tinguely has had an ironic view of it." What, then, are we to say about these machines: the 100-inch Mount Wilson telescope which enabled Edwin Hubble to demonstrate that certain faint smudges of light in the night sky were in fact distant galaxies, and to thereby establish the modern field of cosmology; the finely-tuned "Spirit of St. Louis," which carried Charles Lindbergh safely from New York to Paris, and at the landing of which craft at Le Bourget the arch-prince of the random himself, Alexander Calder, was present; and the mighty Apollo rocket system, which, with its one million individual components, carried twenty-seven humans to, or near, the moon and returned all of them safely to the earth – machines which, in short, represent the precise and splendid instrument of human aspiration? Where – oh where – is this machine to be found in our galleries and museums? Which techno-artist among us has exhibited the gravitas of a Mondrian or Boccioni in dealing with the scientific world view? What works of techno-art, whether "old" or "new," capture the nobility and meaning which a traditional art has invested in all that it surveys – including, in a typical landscape painting from the Renaissance, the quite deterministic stone of the earth itself? This last reminds us of something that we should not have to be reminded of, were it not for the period of riotous excess and forgetfulness which has been post-Modernism: Western art has almost always been closely allied with science and technology. 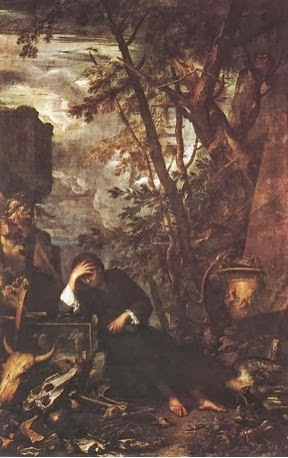 The terms "new techno" and "old techno" are therefore in a sense absurd: the Democritus of Salvator Rosa's circa 1650 painting is no less consumed than twenty-first century humankind by the question of how life and consciousness have emerged from a matrix of buzzing and inarticulate particles. The wound, or chasm, or lack of perspective of which I speak is real; but a wound can have the salutary effect of establishing a desperate and common intensity of purpose. Perhaps our efforts toward a formidable techno-art of the future can be strengthened – and indeed unified – by a collective recognition of this purpose. Science and technology, the handmaidens of materialism, not only tell us most of what we know about the world, they constantly alter our relationship to ourselves and to our surroundings…. If this materialism is not to become a lethal incubus, we must understand it for what it really is. Retreat into outmoded forms of idealism is no solution. Rather, new spiritual insights into the normality of materialism are needed, insights which give it proper balance in the human psyche. A small beginning is to record its effects upon one art form. This book is directed toward that task. Shaken, Edward A., Art and Electronic Media, London: Phaidon Press, 2009. "And yet the greatest poetry sings always, at the end, of transcendence; while seeing clearly and saying plainly the wickedness and terror and beauty of the world, it is at the same time humming to itself, so that one overhears rather than hears: All will be well." Nemerov, Howard, "Poetry," Encyclopedia Britannica, 15th ed., 1983, vol. 14, p. 603. Smith, G. W., Aesthetic Wilderness: A Brief Personal History of the Meeting Between Art and the Machine, 1844-2005, New Orleans: Birds-of-the-Air Press, 2011. Simon, Joan et. al., Alexander Calder: The Paris Years, 1926-1933, New Haven: Yale University Press, 2008, p. 27. Burnham, Jack, Beyond Modern Sculpture: The Effects of Science and Technology on the Sculpture of this Century, New York: George Braziller, 1968, p. x.